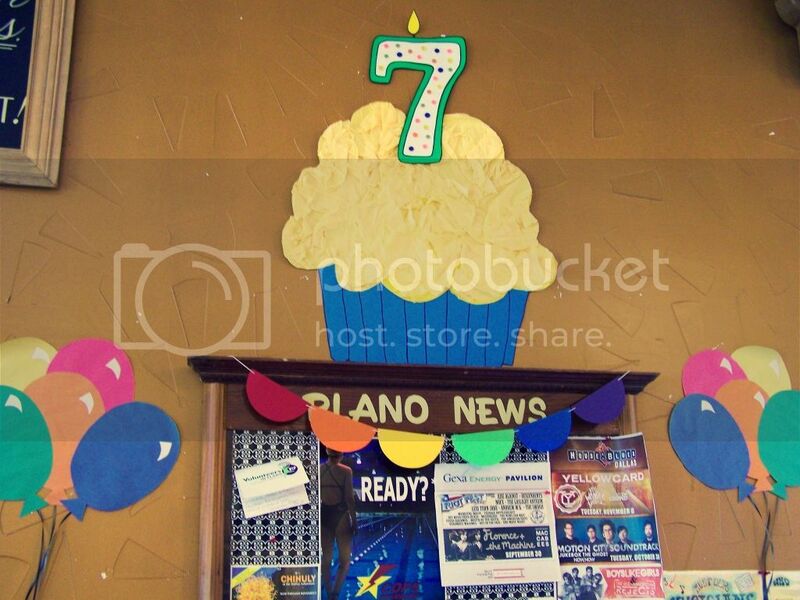 This week is our store's 7th Birthday. Or anniversary. Or whatever word means that it opened seven years ago. That's what it is. What it means to me is another occasion to play with paper. 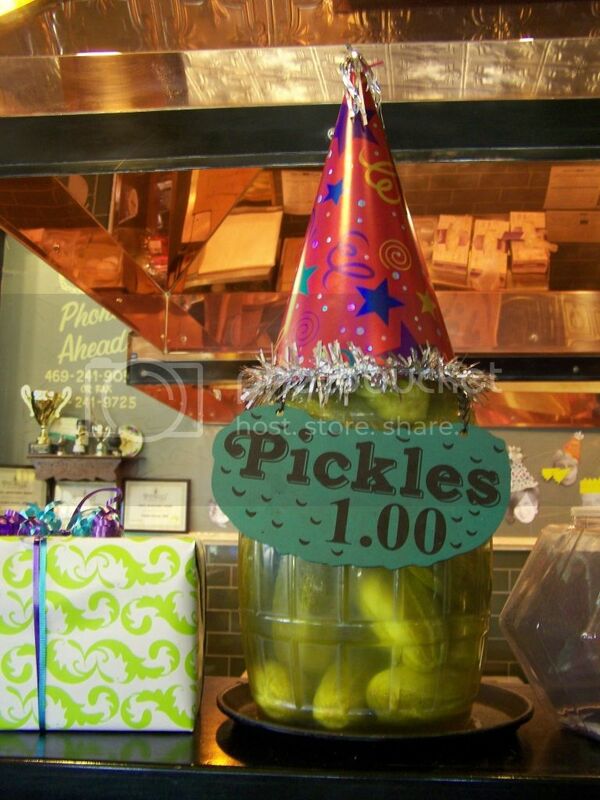 Everyone knows it's not a party without presents, even if they're the empty kind. but the rest of us prefer a more personal touch. Speaking of personal, we even have our own cake popper out-er. 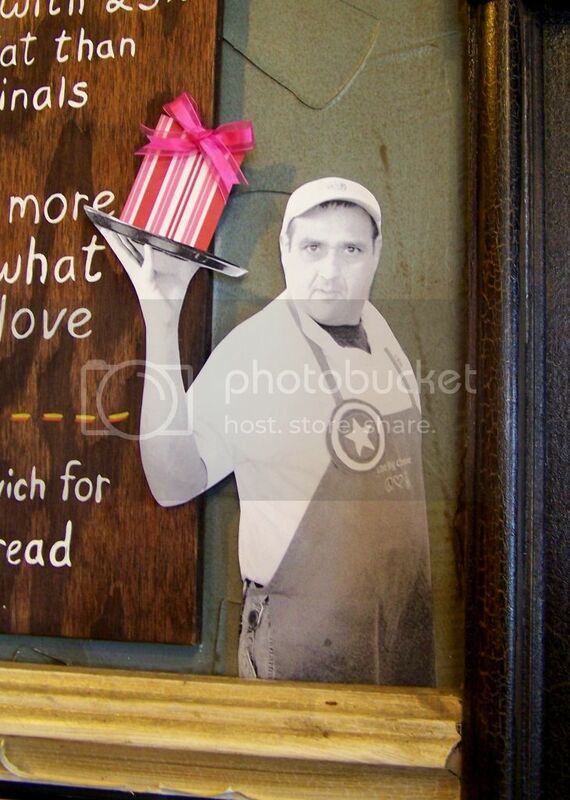 And when he's not hanging out in desserts, we're hanging stuff on him. Cut up cardboard boxes taped together transform into a makeshift pinata. Crepe paper strips, with "fringe" cut alone the bottom, are wrapped around in layers and hot glued on. Viva la Fiesta! 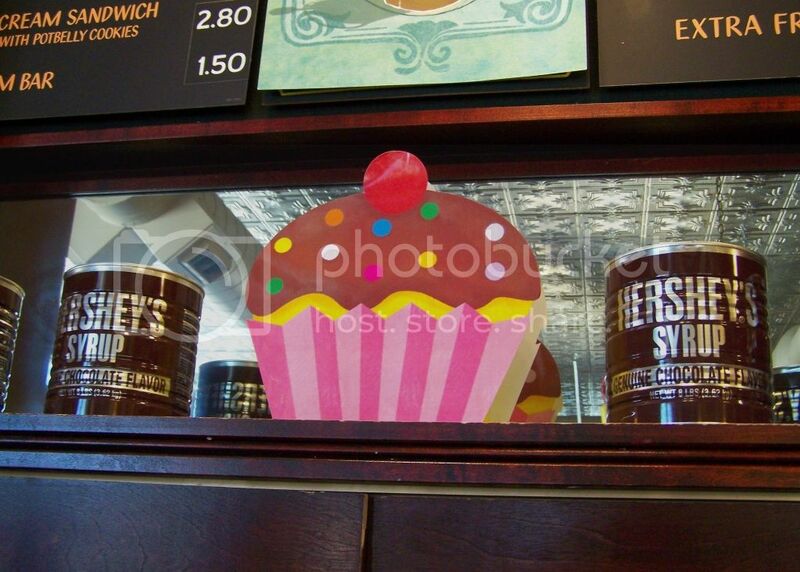 A posterboard cupcake, with crumpled tissue paper icing for texture. Who knew that Dollar Tree had such delicious gift bags? Tuck in the string handles and use them as decoration. And, of course, my favorite party guest. As if I could turn him down. You make it look so easy!!! I tried to make a simple pinata out of cut cardboard recently and failed MISERABLY! Take me under your wing? 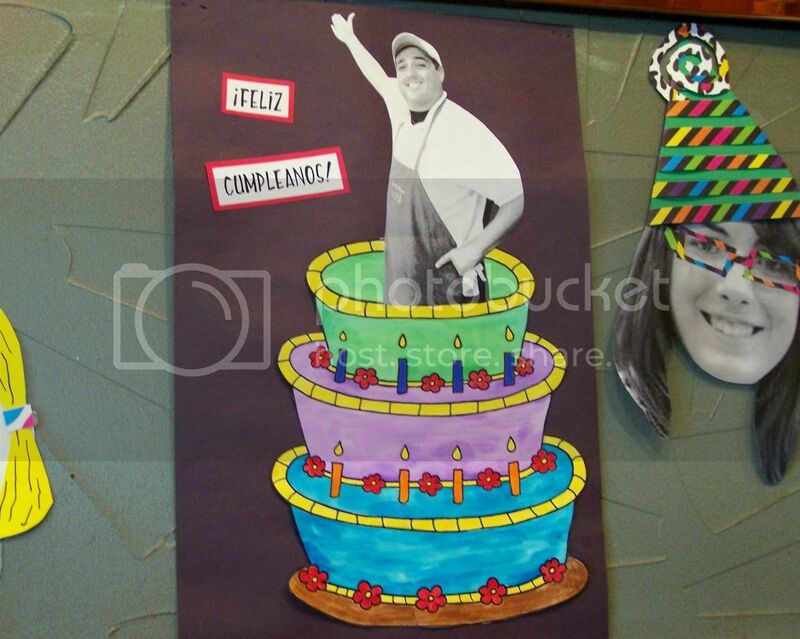 That piñata is amazing. Way to go! Love all your decorations! 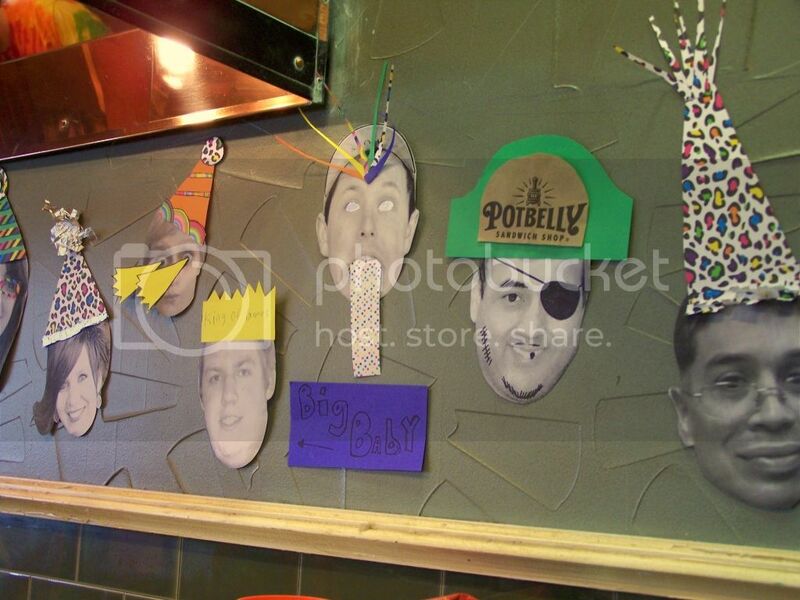 And FIENDISHLY LOVE Potbelly's. Moved from Chicago to Denver and now I make my family all fly through Midway so they can bring me food! 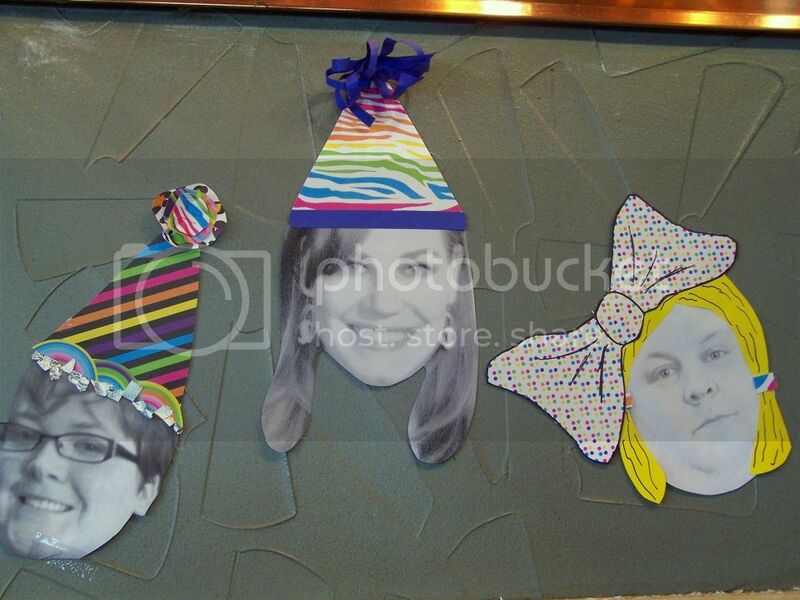 AWESOME decorations, as always! I love it all! How could anyone walk in that place and not smile and be happy?!! Your ideas are the best, and you are so super creative! It's so inspiring! The cake "popper outer" is a riot...so funny! I hope you have a real nice weekend! I want a birthday spankin! The things you come up with are so hilarious! You are just too funny! Love all your decorations and I'm sure everyone who comes in the shop does too. 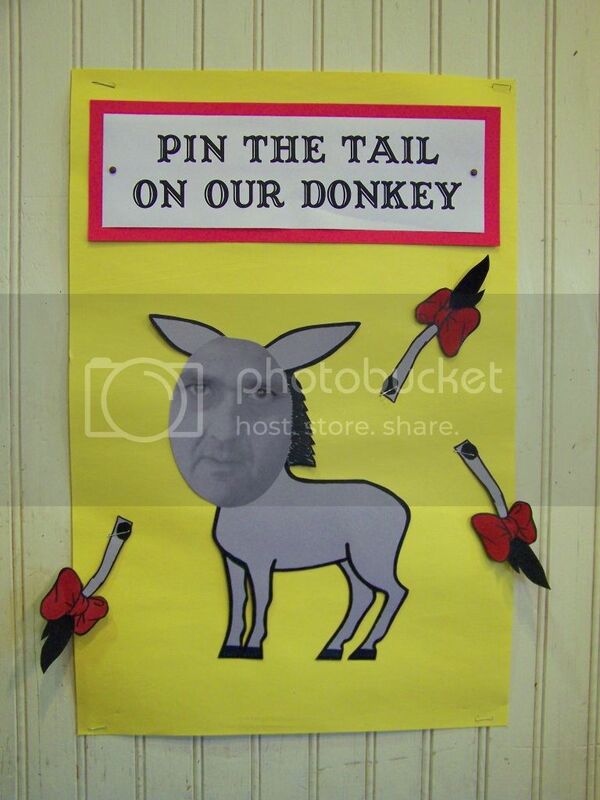 My personal favorite is the pin the tail on the donkey! Too funny! this entire party post is the definition of "a hoot" as in "what a HOOT!!" 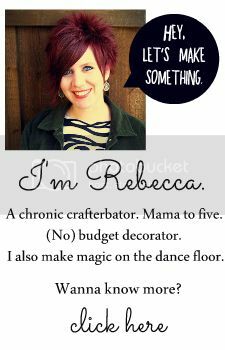 love it....so creative, so quirky and toooo funny! The decorations look great! That seems like a really fun workplace. I love the changes to the blog, too--they also look great. Wow. 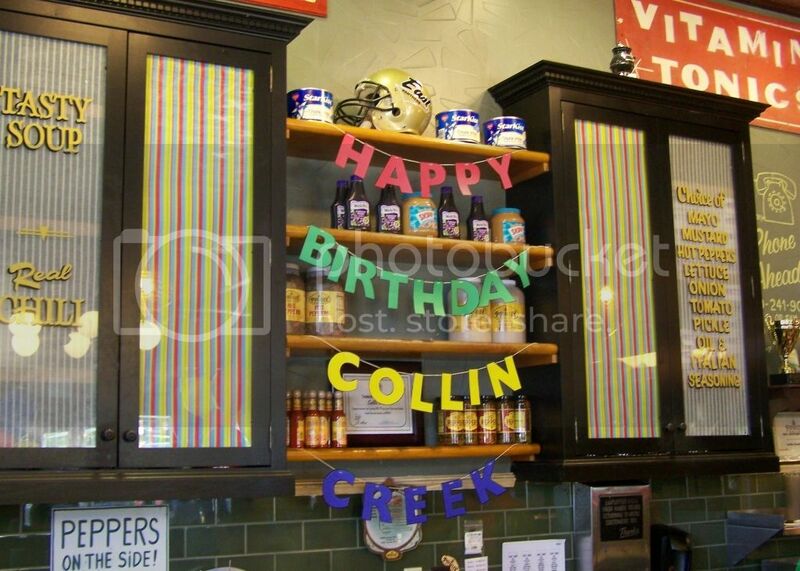 I love the decorating. 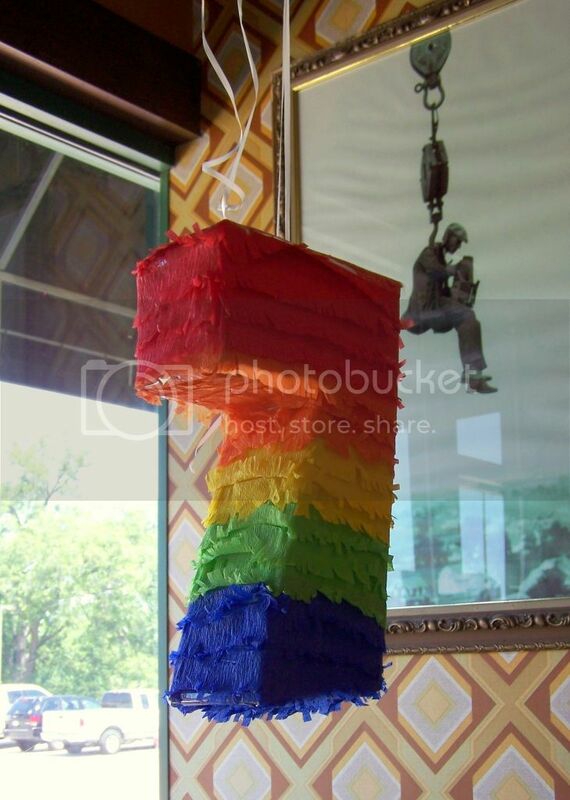 The pinata is fabulous. I bet you make your workplace so inviting for the customers and your fellow workers...Bravo! your friendly cousin here. first of all, pukefest of creativity! ;) fun, fun, fun! 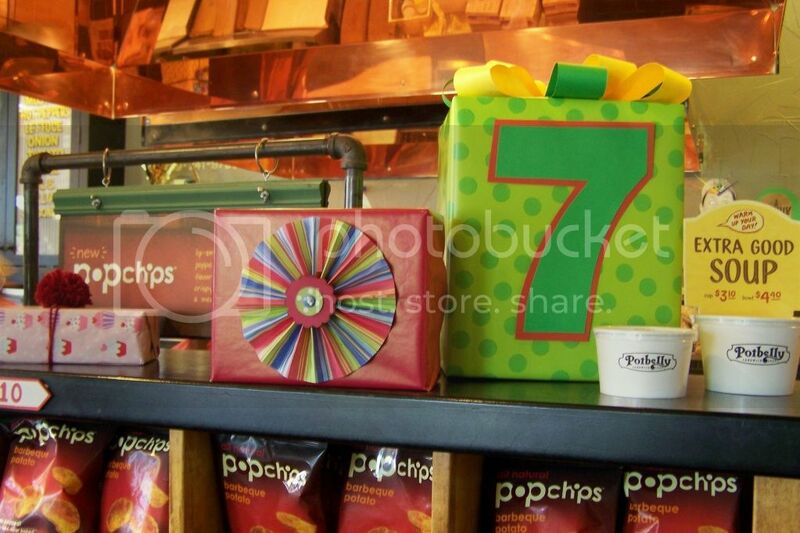 now i want one of those cupcake gift bags!! they better have one at our dollar tree. 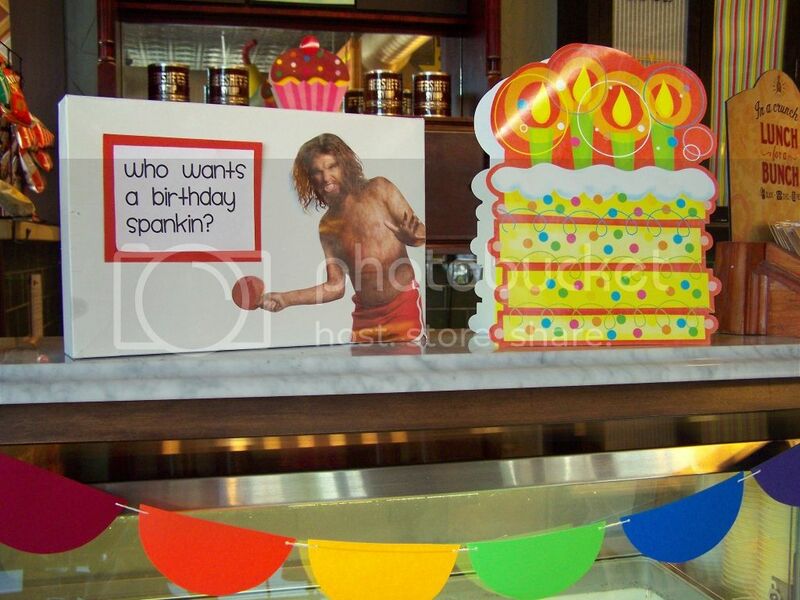 and you must send me the caveman card for my next birthday!!! i am cracking up soooooo hard!!! Seriously they need to give you employee of the year award! Another great job!!! Oh, how cool! So fun and what a great job you do!! Hey Girl, I haven't been by in a while...and now you have a whole new look. 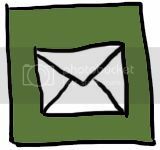 Your blog is spiffy! Happy Anniversary.